On October 9th 2018, His Holiness Patriarch Mor Ignatius Aphrem II celebrated the Holy Qurobo for the occasion of the Holy Synod of our Syriac Orthodox Church, at Mor Severus Church in the Patriarchal Residence in Atchaneh – Lebanon, in the presence of their Eminences Archbishops members of the Holy Synod. Their Eminences: Mor Dionysius Issa Gurbuz, Patriarchal Vicar in Switzerland and Austria, Mor Timotheos Moussa Al-Shamani, Metropolitan of the Archdiocese of Mor Mattai Monastery, and Mor Gregorios Joseph, Metropolitan of Cochin and Secretary of the Regional Episcopal Synod in India, assisted His Holiness. In his sermon, His Holiness expressed his happiness to inaugurate the works of the Holy Synod of our Syriac Orthodox Church with the Holy Qurobo, and that the first Holy Qurobo celebrated at Mor Severus Church happened to be in the presence of all their Eminences Archbishops members of the Holy Synod. Commenting on the Gospel reading, His Holiness said that he and their Eminences should remember the beginning of their ministry, when they were sent by our Lord on their own missions. He stressed that God has sent them to serve His people. The authority they have received from God, as also was the case of the disciples, is to be used for the salvation of souls. He finally prayed that they be for the Lord, servants to Him, that their names may be written in heaven. After the Holy Qurobo, works of the Holy Synod started with an opening session. the Holy Synod of our Syriac Orthodox Church started its sessions at the Patriarchal Residence in Atchaneh – Lebanon. 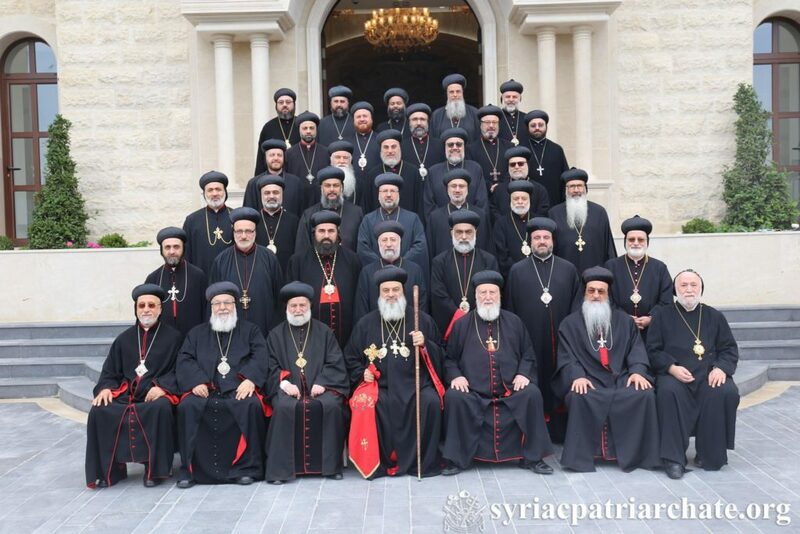 Their Eminences Archbishops and Patriarchal Vicars of our Syriac Archdioceses from all over the world are attending the Holy Synod. His Holiness and their Eminences prayed for the faithful of the Syriac Orthodox Church in the world; they prayed also for peace in Syria, and remembered the two abducted Archbishops of Aleppo Mor Gregorius Youhanna Ibrahim and Boulos Yaziji, asking God that they return safe soon. On October 9th 2018, His Holiness Patriarch Mor Ignatius Aphrem II and their Eminences Archbishops members of the Holy Synod of our Syriac Orthodox Church, visited His Excellency General Michel Aoun, President of the Republic of Lebanon, at the Presidential Palace in Baabda. His Holiness gave a word in which he spoke about the mission of the Holy Synod. He also expressed his support to His Excellency in making Lebanon a center for religious dialogue. His Holiness also spoke about the great role of Lebanon in preserving Christianity in the Middle East. His Excellency then welcomed His Holiness and their Eminences wishing them the best for the synod. He then talked about the importance of real dialogue in reaching peace, and the significance of education in this field. This is why he is working on creating and International Academy for Religious Dialogue in Lebanon, so that the culture of peace may be spread in Lebanon and through it all over the world.